The following is a report on Elizabeth's time as a student. If you want to read what she has been up to since then, do read her report, published in Icon News September 2017, about her time as a William Morris Craft Fellow. Elizabeth started the first year of the two year MA course in Stained Glass Conservation and Heritage Management at York in the autumn of 2010. The course is the only one of its kind in the English speaking world and is longer than a normal MA due to the range of skills and knowledge required by stained glass conservators today. The first two terms were a blend of academic and practical courses in glass handling and conservation skills. In the summer Elizabeth had two studio placements, which “provided an excellent opportunity to compare my previous experience ...at the York Glaziers’ Trust with alternative modes of business, historical contexts and cultural environments”. The two summer placements were in Germany and Belgium. In Germany, where she worked on ten large geometric windows from an early 20th century scheme, the pace of work was rapid and allowed her to gain plenty of experience. In Belgium Elizabeth worked in a studio which combined technical experience with rigorous and detailed research. 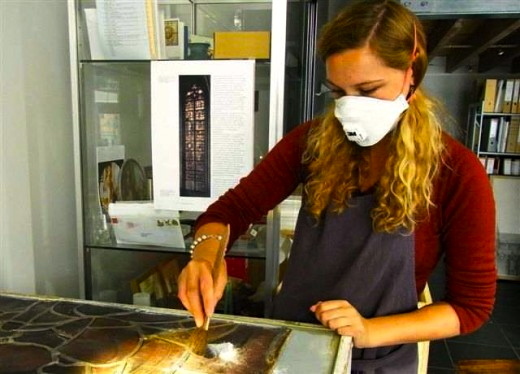 There she worked on the conservation of the windows for a 19th century chapel and on a cleaning and photography project for some 16th and 19th century windows from the cathedral church in Antwerp. Elizabeth wrote “I am thoroughly enjoying the course and embracing the challenges I have encountered. I have had fantastic opportunities to study under the auspices of the leading experts in stained glass in the UK and Europe, and to work on some especially exciting and significant cultural projects. The various elements of the course continue to provide an excellent education, and to prepare me for a career in the field on completion in January 2013”.